Leather leash in blue for a Dobermann, one meter long (about 3 feet), with solid brass snap-hoop. It has been made as companion for the blue dog collar posted last week. 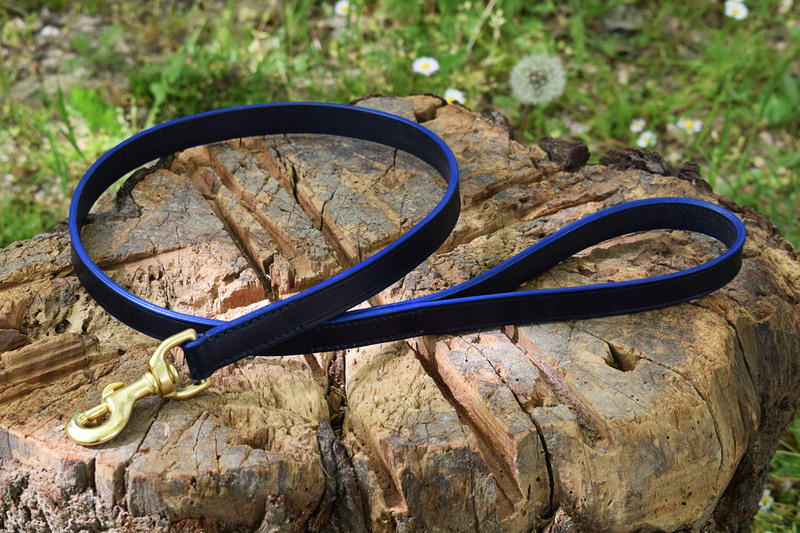 This model of dog leash can be made in blue leather in lengths up to 150 cm. If the length is 120 cm or less, the handle loop will be made with the same leather strip as the main body, as in this case. I can also make the training leash in blue, 240 cm total lenght, 200 cm when in use (6 feet and 6 inches): in this case I will combine three different strips stitched together with a strong sewing thread placed at the adjustment rings. I can use blue leather for any dog size: from the 6 mm wide leather show leash up to this 19 mm wide for big dogs, and even 25 mm. Many types of snap hooks are available, both in stainless steel and solid brass, to satisfy any size and any security needs. All my items, including this leash, can be made in 8 different leather colors: black, dark havana, burgundy, conker, hazel, London tan, red and blue as in this case.